Very social atmosphere. Chilling on the porch with cool people was definitely the highlight of the hostel. Stephano was very friendly and helpful. He hung out all day and told us all the cool things to do in Port Antonio. 10 minute walk into town and restaurants. When other people tried to extend there stay but couldn't because it was booked, they would book another hostel but would come back to chill at this one. Porty Hostel made you feel like you were part of the local community. I had such a great time in Port Antonio and a very good authentiqje experience at Porty Hostel. Chris is amazing! 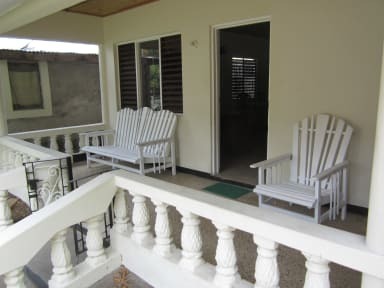 This hostel in perfect for a holiday in Port Antonio. Stefano is the perfect host and he helped me to familiarize myself with the area. 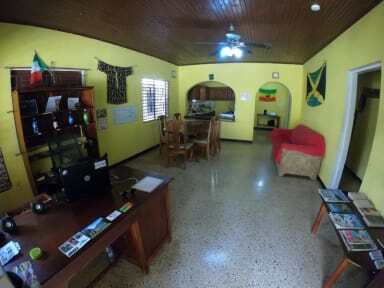 Best hostel in Port Antonio! Nice base for Port Antonio. There's no running water on Mondays and Thursdays so I think if you book on those days you should be offered a cheaper rate. Besides that, the place itself is not very clean but it's a good place to crash after exploring the wonderful sights Port Antonio has to offer! The manager is very helpful and nice...always playing great music! I enjoyed my stay over all. Chris was really nice and made our stay comfortable. Thank you. Great atmosphere- basically like sharing a house with a bunch of mates. Only one bathroom though for... 10 or 12. Place could really benefit from a bigger fridge, microwave, and a frying pan/ more cooking supplies.